We are the renown experts and have sailed in almost every vacation sailing destination on the planet. NO FEE: With NauticEd, you don't get charged a booking fee. We simply work to find the best company at the best price for the best location to suit you. We can even consult on where to go if you're unsure. THE BASICS: To help you understand the basics if you are new, see our "Sailing Vacation How-To". In general, for 1 week, a monohull will cost anywhere from $1,500 to $5,000 and a catamaran will cost $3,500 to $11,000 ($US) depending on size, age of boat, location, and season. Call us on +1 512-696-1070 USA Central Daylight Tme for any questions. Caution: we love talking sailing. Fill out the no obligation inquiry form here and we'll get back to you with some excellent options for your sailing vacation. SEASON SPECIAL: Get a free NauticEd T-shirt when you make your booking with us. Enter sizes in the form below. (For shipping reasons, USA residents only). You are welcome to search our travel agent database yourself below or you can let us do the work. NOTE however, we also can book Sunsail and Moorings and many other Mediterranean companies that may not be listed in the search below. REMEMBER we don't charge you a fee for our excellent services, it just comes with the NauticEd territory. We are really knowledgeable on most every location and can give you lots of extra unbiased information. Please Note: When you perform a search for yourself, the listed prices are the boat charter prices. They do not include mandatory extras (cleaning, taxes, fees) or damage insurance (recommended but not required by all companies). In the Mediterranean, sheets, towels, and outboard engine for the dinghy are sometimes extras. These extras can range from $300 to $1000 depending the size of the boat, the company, number of persons on the boat, and the location. When you contact us about a specific boat, we can detail these exactly for you. A simple phone consultation can make your trip 10 times better with our vast knowledge: games, secret bays, untouched locations, kids, boat types, licensing, provisioning, local preferred companies, cost savings, etc. Please provide other information so we can help you have an awesome sailing vacation (e.g. a/c is a must, number of kids, licensing questions, budget requirements, help me with the location). Free when you make your booking. Recommended for your convenience: if I book through NauticEd, automatically add my charter sailing days into an authenticated multi-day logbook entry on my resume. Your email address is not registered with us as a student. That is not a problem. We love to help people take sailing vacations. And we are the renown experts. Create a student profile as well and get two free sailing courses right now. Just make a sailing vacation inquiry for now. Whoops. I am already a NauticEd student. To associate this request with your account - please change contact email above to your account email. If you are not sure, check any emails from us and view the "To:" email address. If your NauticEd Email address is out of date, no worries, enter it above anyway and in the next page you will be able to log in and edit it. When you login go to profile then click on login data. At NauticEd we're experts on how to bareboat charter a yacht on dream sailing vacations. 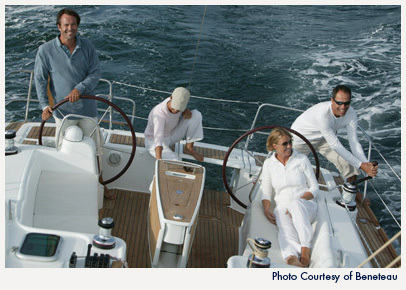 Our faculty and staff have been chartering yachts all over the world for dozens of years. And, as natural as it is to teach bareboat yacht chartering through our courses, it is equally natural to help you with bareboat yacht charter sailing vacations of a lifetime. We don't charge you a fee for this service. We'll get you the same price that you'd pay by going direct. However, the biggest advantage is that we have insider access to all the daily discount specials. We can also advise you on the best sailing destinations based on your specific needs because chances are we've been there personally. We're also specialists in how to design a yacht charter flotilla. We've got suggestions on fun beach games, ideas on how to run a small yacht race, competitions and prizes etc to make your flotilla extremely memorable. Let us go to work finding you the absolute best suited deal, boat and location for you and we'll even help you design an itinerary of stops and anchorages ... because again, chances are we've already been there.